Printed in 1861 by William Dickes using the Baxter Process abd published by the Society for Promoting Christian Knowledge, SPCK for short. One of 12 reward cards in a set of Wild Animals sold by the SPCK. 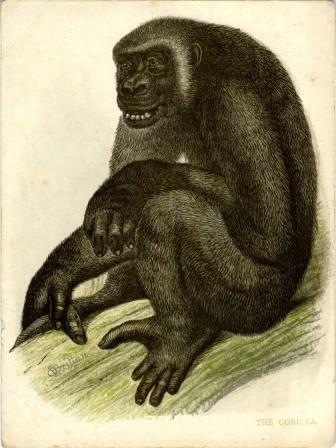 A second set of 12 cards of different Wild Animals was printed and published in the same year. The pictures and descriptions were also sold in book form. 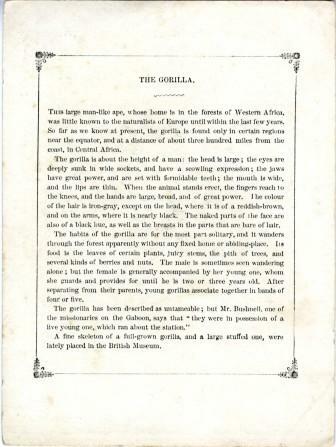 As well as the picture on the front of the card there was a description of the Gorilla on the back. Card size 13 x 10 cm.